Most of the cycling right on my doorstep is purpose built cycle paths, which are nice, but definitely not knobbly terrain. I’m starting to do more cycling around home with the family, and so I needed some tyres that were more tarmac suited. However I still wanted the option of going offroad a bit if possible, so had a look for some multi purpose tyres. My previous experience has been that multi purpose used to mean “not good at anything”! But everything has moved on, so I thought it was worth a go seeing what was out there. After some research and online reviews, I decided to try the Schwalbe Land Cruiser in a 26″ x 2″ size. It is also available in 1.75″ width. 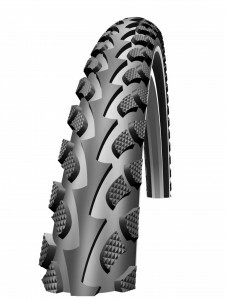 The Land Cruiser is a very reasonably priced tyre at £13.59 at Wiggle, and has a centre ridge with diamond shaped knobs alternating out of each side. It reminds me a little of Tioga’s old Farmer John’s Nephew (now that was a while ago! ), but with good escape channels for mud to the sides. The sides have some large sized knobbles for cornering offroad, with a rough texture on top of them for road surfaces. The tyre casing has 50 EPI, providing better puncture protection and smoother ride. Speaking of punctures, the tyre also features a kevlar protection belt. There is a penalty however – these are chunky tyres weighing in at 900g (760g for the 1.75″). On road pumped up the tyre is great. The centre ridge gives a smooth, fast ride, with nice predictable cornering. So far so good. Offroad I was surprised, pleasantly surprised. The tyre grips far better than I thought, and on the rear actually gave the same performance round the Croft Trail as I got from an old Panaracer Fire XC – really good. Croft has a fairly hard surface overall and conditions were dry as well, but it still performed very well. For use on the front I’d definitely recommend the 2″ over the 1.75″, but I always like bigger tyres on the front to maximise grip. If you’re going to use it mainly onroad, you could probably get away with the 1.75″. As a multi purpose tyre, its very good and works well on and off road. It’s also very good value. The only issue I have with it, is it’s weight. It’s really heavy and could really do with loosing a bit, but if you can put up with that, its a great tyre.